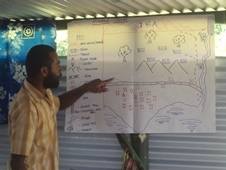 An initiative at Natewa Tunuloa IBA in Fiji demonstrates that appropriate interventions at IBAs can ensure that ecosystem service benefits are sustained and that development benefits are enhanced for local people. With appropriate natural resource governance arrangements and technical support, the goods and services that IBAs provide can form the basis of local social and economic development. The Natewa Tunuloa IBA in Fiji is owned by indigenous peoples who are organised in land-owning units or clans known as mataqalis. Communities living in the vicinity of the IBA rely heavily on forest resources for firewood, hunting, timber, medicinal plants and wild foods. In October 2005, the Sisi Initiative, supported by BirdLife, was established as a community-based volunteer group charged with leading efforts to conserve the IBA in response to threats from illegal logging, forest fires, overgrazing, agricultural encroachment and invasive species. The initiative provides communities with alternative livelihood training, including projects on bee keeping, poultry rearing, handicraft and jewellery making, baking and sustainable agriculture. This development is helping to conserve 6,000 hectares of forest. The mataqalis have refused logging concessions within the demarcated area, and are undertaking activities that will restore and enhance the remaining tracts of native forest.